Kirra Beach Tourist Park is situated 300 metres from famous Kirra Beach at the southern end of the Gold Coast. A spacious, open park this is the ideal place to bring the kids or all your friends for a group get away. Facilities include a play-ground, pool, jumping pillow and recreation room, so no need to leave the park during your stay. Not too far from the New South Wales border, Kirra Beach is well known for its appeal to surfers. The wide range of accommodation options available includes two bedroom lake view villas that sleep up to four guests. Lodging rooms sleep up to two guests and are perfect for the budget conscious. Also choose from powered and unpowered sites suitable for caravans, camper trailers, camper vans and tents. The park’s special dog friendly area is a popular option for guests travelling with their four legged friend (conditions apply, enquire with friendly staff). Coolangatta airport is within a short drive. With access to public transport and major roads, this park gives you easy access to all the various attractions of the Gold Coast while still being in a quiet, natural environment. Self contained two bedroom villas all include linen and towels and sleep up to four with a Queen and Single Bunk beds. Features include a fully equipped kitchen with dishwasher, hot plates, microwave and fridge, air-conditioning, ceiling fans, LCD television with DVD player, Foxtel, front balcony with barbecue and outdoor table. Set beside a lake in beautiful landscaped gardens, these villas offer peacefulness and privacy. Rates are based on a two adult and two child villa share. Daily extra person charges apply. 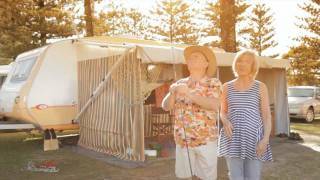 Choose from a variety of powered and unpowered sites that accommodate caravans, camper trailers, campervans and tents. 160 powered sites and 22 unpowered sites. Dogs are welcome with guests staying on powered sites in their special dog friendly area (conditions apply). Bookings may be made directly with the park by phone or email. Park facilities include a pool (heated seasonally), playground, jumping pillow, camp kitchen, barbecues and recreation room and areas. Rates are for two persons. Daily extra person charges apply. Ideal for the budget conscious, all lodging rooms sleep up to two with choice of a queen or twin single beds (linen and towels included). Features of the room are a mini fridge, television, ceiling fan, air conditioner and lounge seating. Bathroom and cooking facilities are shared. The camp kitchen is fully equipped with a fridge/freezer, hot plates, microwave, toaster, kettle and barbecues.